Note: This project is my entry into the 2015 Hackaday prize and is also documented at Hackaday.io. Millions of young athletes get concussions each year and 50% go undiagnosed, leading to brain injury. Impact detects these events early. Most concussions resulting from sports go diagnosed either because the player doesn’t recognize the symptoms, or because they are encouraged to “play through” the pain. Most traumatic brain injuries from concussions occur because the patient isn’t taken out of the situation. 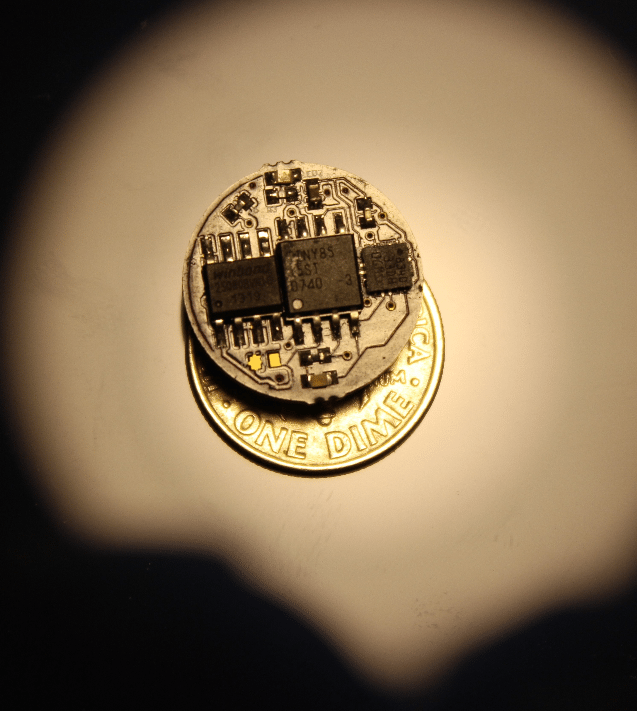 Impact is a device the size of a dime and is powered by a small coin cell. It runs at an extremely low power so that the battery doesn’t need replacing often. The small size allows the device to be concealed in sports equipment like football helmets. After a player comes off the field and takes their helmet off, a trainer can see if the LED is blinking, which indicates the acceleration threshold was tripped and the player should be screened for a concussion. A complete data log can be downloaded after the game for further analysis. The threshold of acceleration that corresponds to a concussion can be set by the user. There are various numbers that appear in the literature that are likely to result in a concussion. 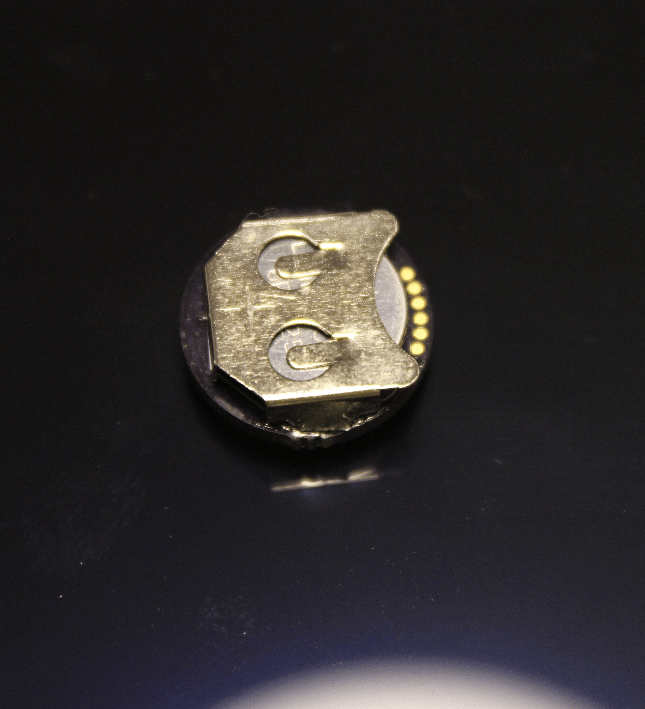 To download the raw data off of the device, a “docking station” with pogo pins is used to make contact with the test points located on the back of the device, just below the battery. This saves the cost and space of a connector. For simplicity, an LED is used to indicate if the acceleration threshold has been passed. One design decision I’ve been contemplating is adding a small radio so that trainers and doctors can immediately determine if a concussion has occurred. This will reduce the battery life, increase the cost, and increase the complexity though. I would also probably have to switch from the ATTiny85 to something like CC430 that has a microcontroller and radio built in if I didn’t want to grow the size much. So I’m not sure if I’ll do that or not. Maybe I’ll make two versions, one with a radio and one without and see which works better. I still need to build the programming/data download jig. This will probably be a little 3D printed, hinged thing with pogo pins on it so the device can be clamped down in it. There’s also a functional problem I need to fix in the current iteration. The accelerometer changes the impedance of the lines going into the ATTiny85 for programming, which means you can’t both program the chip and have the accelerometer populated. You have to first populate the Tiny, program it, and then populate the accelerometer. So I need to play around a bit to fix that design problem. Schematics and such are available on Github. I coach youth football players and made a similar device utilizing an ATtiny10 along with an ADXL accelerometer over I2C. In order to program the MCU I had to add jumper pads (think of a split oval) that once I programmed the MCU I placed solder balls to short the I2C lines to the accelerometer. The LED feedback is great for coaches and parents to monitor the impact but it also becomes a game for the players because they will try to light up the other players sensor. This lead to a more sophisticated device that I am currently working on and hopefully turn into a product soon. As for programming, I use the cable from http://www.tag-connect.com on my Atmel Programmer. That’s great! I never even thought that getting the LED to turn on would turn into a game for the players haha.